We are Industrial Relations, Human Resources and Leadership specialists with a pro-active approach and a proven 30 year + track record of empowering South African employers. 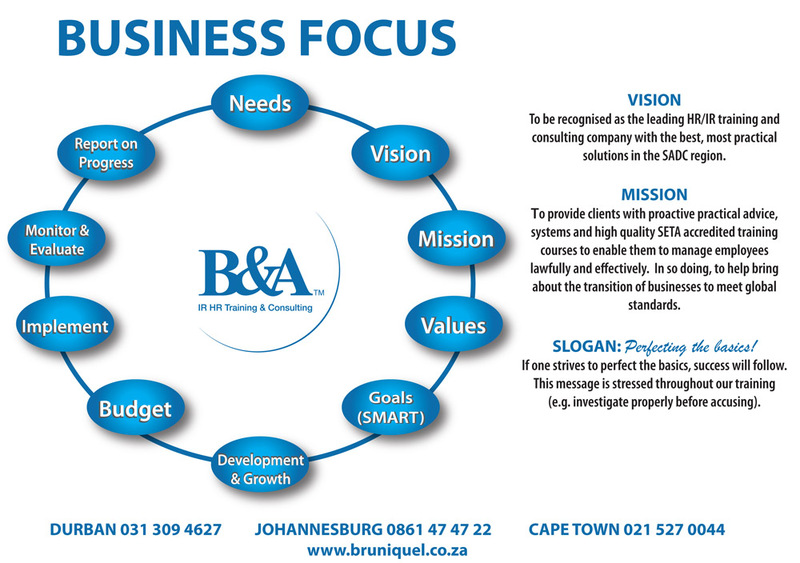 Learn more about the B&A team. We have a national presence, with a head office in Durban and branches, franchisees and agents across South Africa. This ensures we can bring our knowledge and skills to all of the country’s major industry centres. We are known for the high quality of our product offer, and are accredited with both the Services SETA and ETDP SETA. We have achieved the sought-after 3 star grading from the Services SETA covering legal compliance, quality management and customer service. We are client focused, seeking always to understand your needs and problems and to tailor solutions and training to meet your needs. As your business partner we will always go the extra mile to deliver the best possible service on a retainer or project basis. Pioneers in diversity, we have a Level 1 B-BBEE rating. We employ internal and external consultants on merit and for the skills they can bring to each project. We are communications savvy, up to date in terms of technology and active on multiple social media platforms, including Twitter, Facebook and LinkedIn.